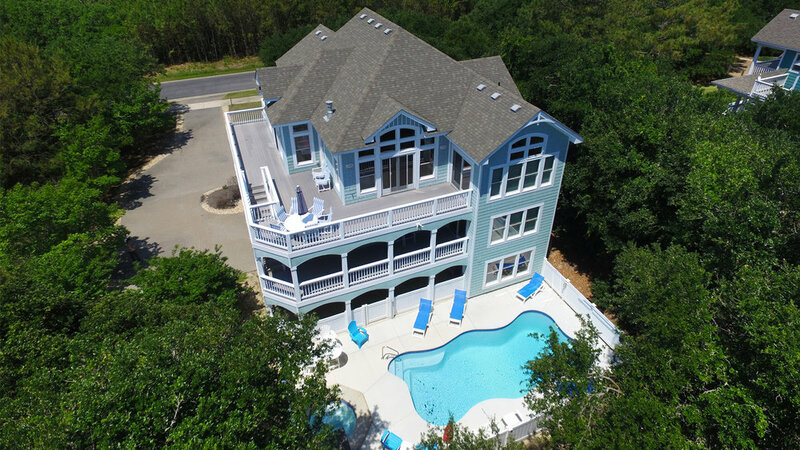 Eagles Landing is a luxury 5 bedroom home in the heart of The Currituck Club of Corolla, NC on the #10 fairway, and it is conveniently located near the resort recreation amenities. Be our guest and enjoy your vacation in a large professionally decorated living space with golf course views, private pool, home theater, and a game room with pool table. Enjoy your day at The Pine Island Beach Club with an uncrowded beach and a beautiful oceanfront pool. From our Hunt Club Drive location, it’s a short walk to the resort Rees Jones Golf Course, tennis courts, fitness center, playground and community pools. The Harris Teeter grocery store is just around the corner. If you have questions or if you are ready to reserve your vacation stay, contact us, and we'll help you take the next step. If you have questions or would like to make a reservation, just contact us. Eagles Landing is located in The Currituck Club in Corolla, NC. The home is near the main entrance and the main recreation facilities including community pool, club house, fitness center, tennis courts, and basketball courts. The community is adjacent to the Harris Teeter Shopping Center. The Tim Buck II Center is 1 mile north, and the Whalehead Park and Currituck Lighthouse is 4.5 miles to the north. In addition to the rent, there are required fees for taxes and departure cleaning. Please inquire, and we will send you a quote for your week. Once the reservation and deposit are complete, there are no refunds. However, we will make our best effort to re-rent the house for the cancelled week for the full amount. If the week is re-rented, we will refund the amount paid, less any price difference and less a $200 cancellation fee. Pursuant to North Carolina regulations, refunds are not required for inclement weather including hurricanes and mandatory evacuations. Travel protection for hurricanes and other potential trip interruptions from third party insurance companies, and it is highly recommended for the period of mid August to mid October. We accept personal checks and all major credit cards for all payments. We will never request or accept wire transfers for payment. Our standard payment terms are 50% of the rent portion on reservation, and the balance is due 30 days prior to arrival. For year in advance reservations, we accept a small initial deposit of $100, with a second deposit in January of 50% of rent portion, less the $100 already received. We have listed our home on VRBO.com and Homeaway.com for over 10 years. When you book directly through us, you will never pay a service fee, period. The home rents for full weeks from Saturday – Saturday during the in season months of May through September. Partial weeks and alternate check-in days are considered from October through April. Please contact us to confirm availability. We will prepare and send you a rental agreement by email which you may print, review, sign, and return with your reservation deposit. If you wish to pay by check, you may remit the check with your rental agreement. If you would like to pay by credit card, please request credit card payment, and we will send you an online invoice from our credit card processor so you may remit online through a secure checkout form. Your final payment is due 30 days prior to arrival. You will receive a comprehensive check-in document with everything you need to know for your arrival and stay. On your arrival day, you will receive a call from housekeeping when the home is ready for you. You will then go directly to the house and enter using the electronic lock and the unique code set for your stay. Send us a reservation request or just an inquiry with your questions about our home and the resort area. We will respond as quickly as possible. We're always glad to help! Thank you very much for your inquiry. We will respond to you as soon as possible. Or just call us directly to discuss your reservation and vacation details.